Muzzling buggy and insecure Web browser plugins like Java and Flash goes a long way toward blocking attacks from drive-by downloads and hacked or malicious Web sites. But leaving them entirely unplugged from the browser is not always practical, particularly with Flash, which is used on a majority of sites. Fortunately for many users, there is a relatively simple and effective alternative: Click-to-Play. 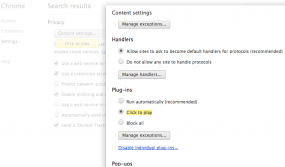 Click-to-Play is a feature built into both Google Chrome, Mozilla Firefox and Opera (and available via add-ons in Safari) that blocks plugin activity by default, replacing the plugin content on the page with a blank box. Users who wish to view the blocked content need only click the boxes to enable the Flash or Java content inside of them. 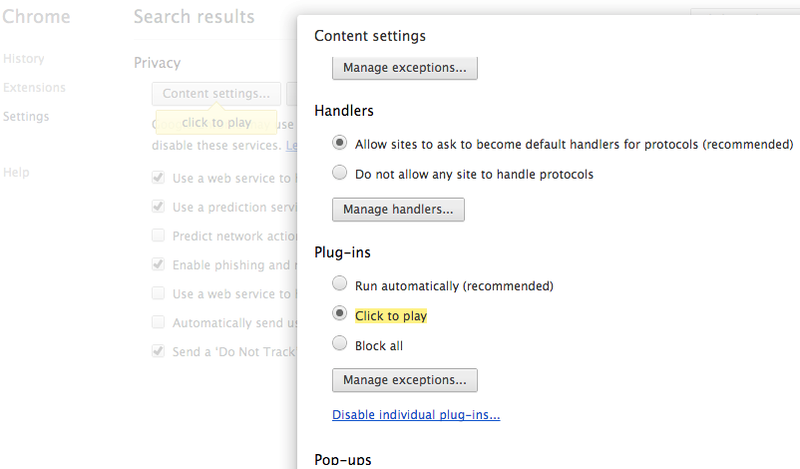 To enable click-to-play on Chrome: From the main menu, click Settings, then in the search box type “click to play,” and click the highlighted box labeled “content settings.” In content settings, scroll down to the “plug-ins” section, and change the default from “run automatically” to “click to play”. To enable exceptions so that certain sites (krebsonsecurity.com?) are allowed to load Flash and other content by default, click the “manage exceptions” box. Alternatively, this can be done in Chrome through the address bar: when you browse to a site that has content blocked by the click-to-play feature, an icon will appear on the far right side of the address bar that allows you to add an exception for the current site. 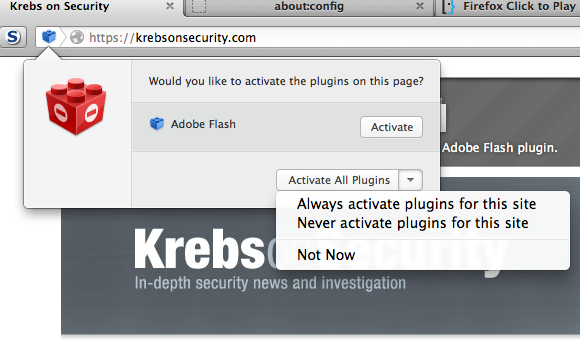 To enable click-to-play in Firefox: Open a browser window and type “about:config” without the quotes. In the search box at the top of the resulting window, paste the follow “plugins.click_to_play”, again without the quotes. Double click the entry that shows up so that its setting under the “value” column changes from “false” to “true” (hat tip to F-Secure.com for this advice). To enable per-site exceptions, look for the blue lego-like icon in the lefthand portion of the URL bar, and click it; click the “activate” button to enable plugins just for that session, or to make it permanent for that site, click the down arrow next to “activate all plugins” and select the “always activate plugins for this site” option.